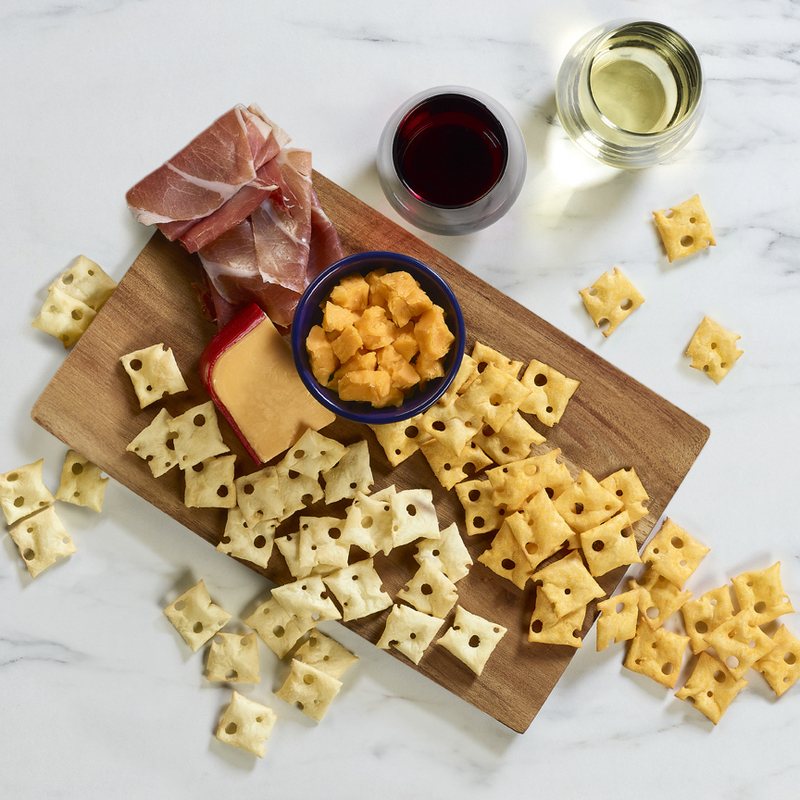 We attribute our growth to providing quality snack products at fair prices to our consumers. Our products are distributed nationwide using a combination of our store door distribution system with direct delivery to grocery stores, a distributor network, and a vending and foodservice sales division. We also have a strong international business with sales on every continent except Antarctica. 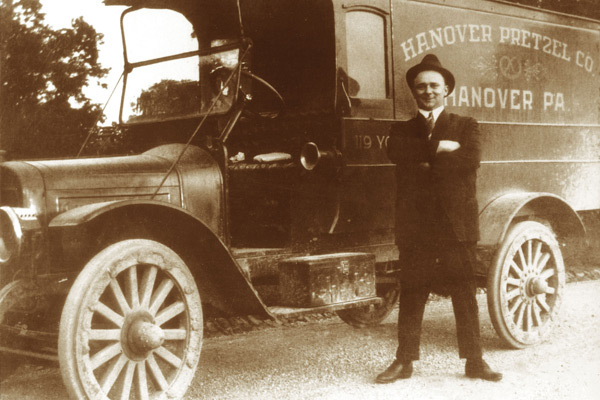 From our humble beginnings to our position today as the leader of the pretzel industry and a major player in the snack food industry, we celebrate the efforts and innovations of our predecessors and their families and eagerly anticipate many more years of pretzel pride as we continue to be America’s favorite pretzel. Harry Warehime began producing Olde Tyme Pretzels. 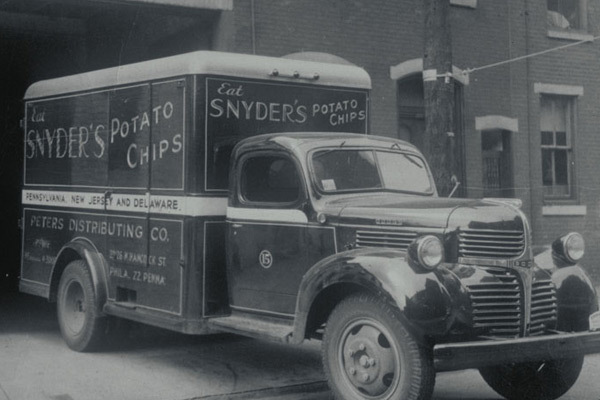 In the early 1920s, Grandma Eda and Edward Snyder II began frying potato chips in a kettle at their summer home, and they sold the snacks door-to-door, at fairs and farmer’s markets. Meanwhile, their son William V. and his wife Helen were making angel food cakes for local stores. The family united forces as Snyder’s Bakery, where they made everything from angel food cakes to fresh noodles until the automated snack production process took over. Modernization was underway in the 1940s with a new plant built on Lafayette and Granger Streets including an automated direct fire ferry fryer. 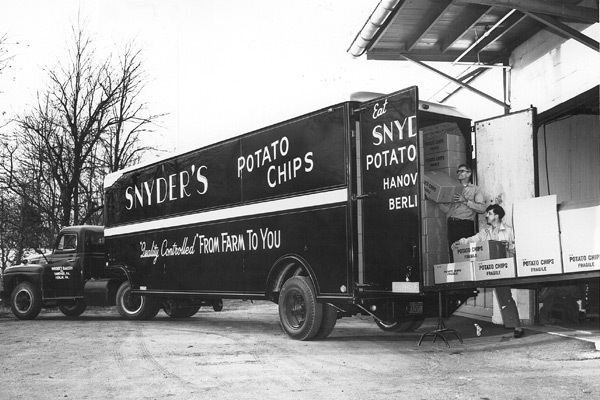 William Snyder, E. Wise and H. Ness joined together to create the Potato Chip Institute to improve communication among competing “chippers”. 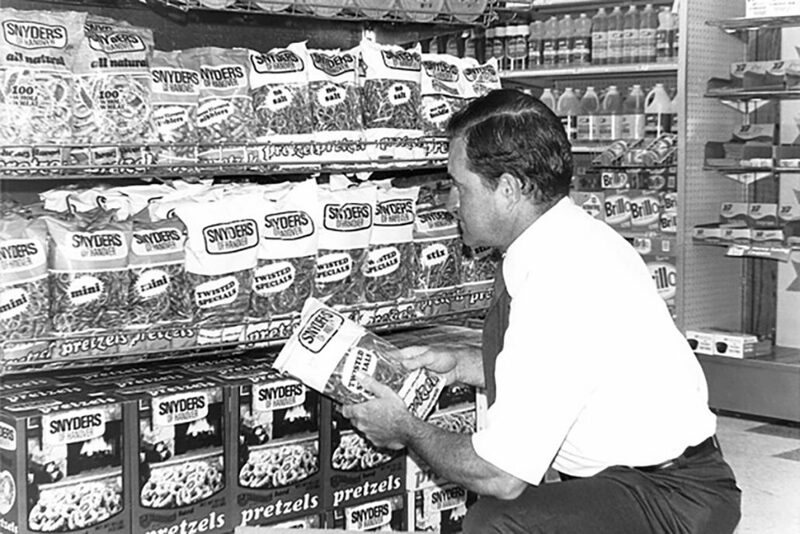 Snyder’s grew distribution south to Norfolk, VA, west to Pittsburgh, PA and north to New York as the company began using aluminum foil bags to extend the shelf life of products in these distant markets – it was a first for the industry, and a very practical innovation. A new plant in Berlin, PA was built to handle growing demand. By the early 1960s, sales had reached about $400,000. The Bechtel Pretzel Company, founded in 1947 by Bill and Helen Bechtel, was purchased and incorporated into Snyder’s Bakery. Bill developed the original recipe for the Sourdough Hard Pretzel that is still enjoyed by consumers today. Michael Warehime, Alan’s youngest son, joined the company. He was named President and Chief Executive Officer in 1972 and Chairman of the Board in 1990. Our growth, new product development, and strong emphasis on quality in all that we do are attributed to Mike and his vision and leadership. 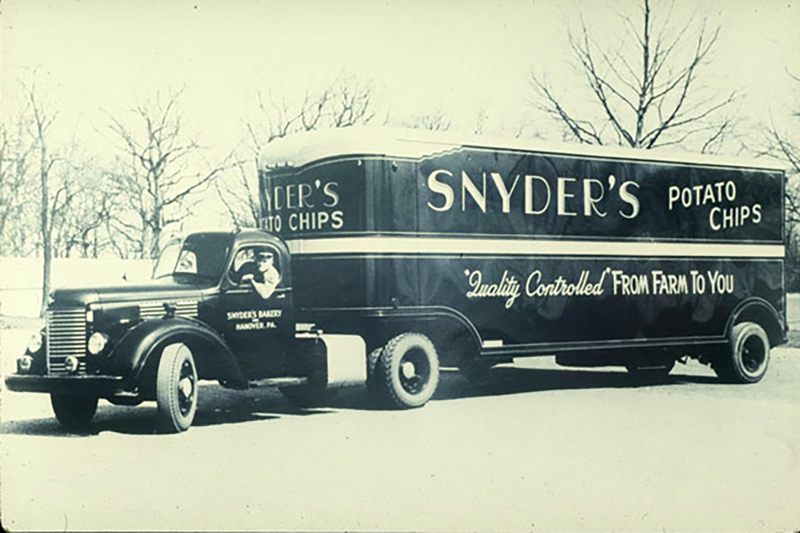 Nineteen years after Snyder’s was purchased, the Warehime family decided to “spin off” the Snyder’s of Hanover® Snack Operation from Hanover Brands, enabling the companies to focus on their respective industries of snacks and vegetables. Snyder’s sales in 1980 were $15.8 million. After the split, both companies exploded, growing faster than industry averages. California-style corn tortilla chips were added to Snyder’s snack line. On Saturday, December 2, 1989, our flagship Hanover pretzel bakery burned to the ground when an overhead heater malfunctioned and fire started in the warehouse area. Fire departments from many surrounding communities fought the dramatic and overwhelming blaze. The “glow” could be seen in the night sky for miles around. It smoldered for several days. Fortunately, no one was injured. Pretzel production continued at the Granger Street facility. 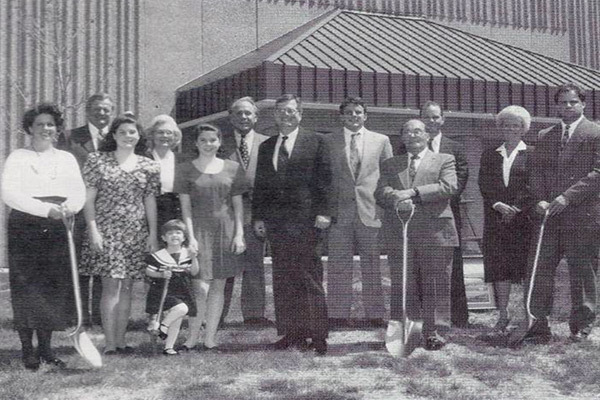 Our employees pulled together and completed a massive cleanup and the building was rebuilt and expanded regularly. Today, it is over 400,000 square feet and includes product processing, packaging, and warehousing as well as a large research and development laboratory. Flavored pretzel pieces burst onto the market with Honey Mustard & Onion flavor, with Buttermilk Ranch and Cheddar Cheese following the year after. Our Olde Tyme Pretzels, first made in 1909 by H.V. Warehime, took the Automatic Merchandiser’s Product of the Year Award. Snyder’s revealed a sweet side, introducing milk chocolate and white chocolate pretzel Dips. Also, our facilities expanded including the development of the new Goodyear, Arizona plant and the Snyder’s headquarters completion. 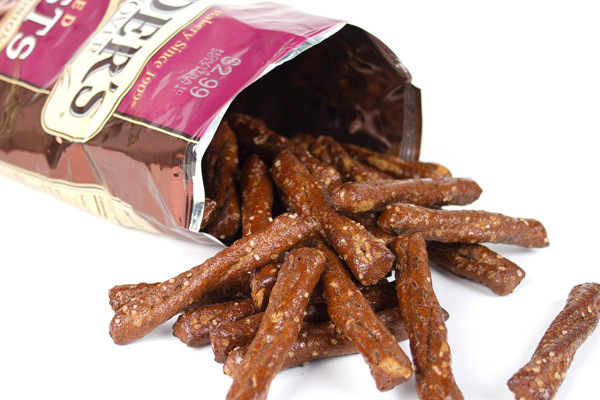 Pumpernickel & Onion Pretzel Sticks were introduced. Only a year later, Health magazine included the sophisticated snack in its “Best of Food” awards. 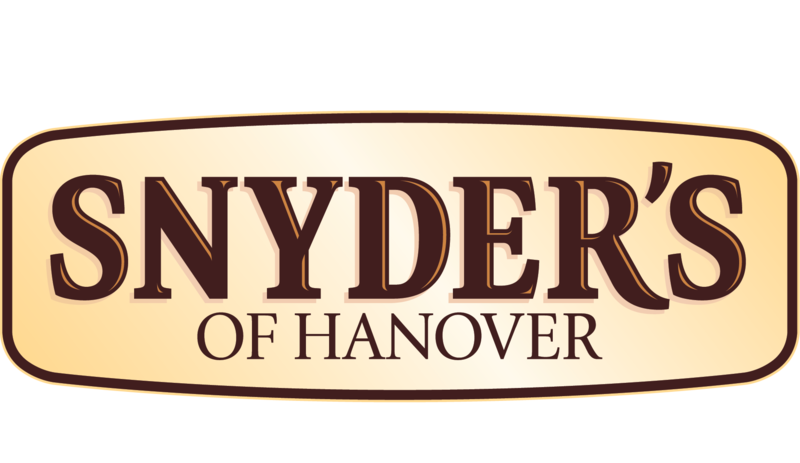 In August of 2010 Snyder’s of Hanover® introduced Certified Gluten-Free Pretzel Sticks. In 2011 Snyder’s of Hanover® built a 26-Acre Solar field- the largest in Pennsylvania. It has over 15,000 pannels and generates enough energy to save roughly 30% of the energy costs in the factory and plant. 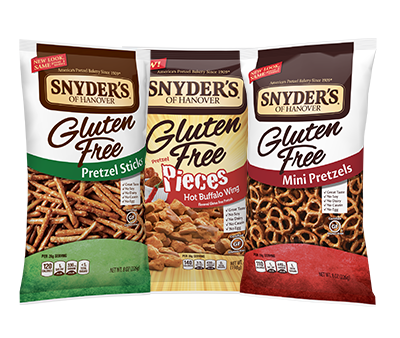 In September 2013 Snyder’s of Hanover® introduced two new Certified Gluten-Free Pretzel Sticks Flavors: Hot Buffalo Wing and Honey, Mustard & Onion. Sweet and Salty Pretzel Pieces and Pretzel Spoonz are introduced. 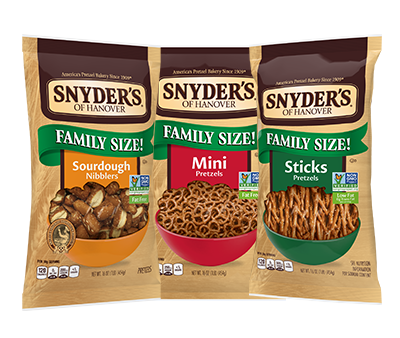 In February 2015, Snyder’s of Hanover introduced Pretzel Poppers in 3 flavors. 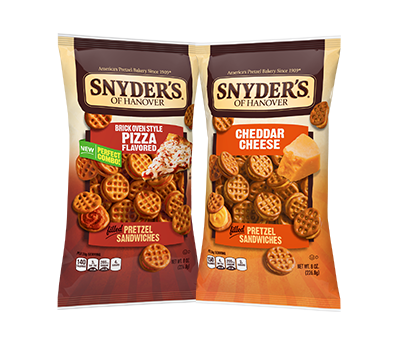 Snyder’s of Hanover introduces Peanut Butter Filled Pieces and S’mores flavored Pretzel Pieces. Snyder’s of Hanover enters the cracker category with New Wholey Cheese! line, available in three flavors. Snyder’s of Hanover Gluten Free Hot Buffalo Wing Pretzel Pieces are introduced. It’s #spring - snack outside today! #MakeSomeNoise even in silent mode for the irresistibly slow-baked crunch of Snyder’s of Hanover pretzels. This #pi day, take yours to the next level with a pretzel crust pie like @bakingthegoods did!